Madison Throws Club has been working with throwers from around the State of Wisconsin and beyond for 10 years now, but the 2012 throwers raised the bar like no other group has in the past. I couldn't be more proud of the hard-work and dedication shown by every athlete that I have had the opportunity to work with but some of these athletes have set the bar higher for the athletes that will follow them and deserve special recognition. 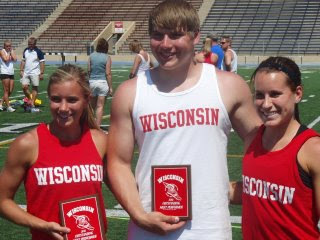 Several MTC athletes had throws that put them on the ALL-TIME performance list for the State of Wisconsin. MTC athletes had some awesome performances to qualify for the state meet. Then had the best State meet in MTC history with 5 runner-ups and 4 new State CHAMPS. The reigning Olympic Discus Champion, Stephanie Brown Trafton has earned the right to defend her crown by winning the U.S. Olympic Trials. Her throw of 213-10 inches easily outdistanced the field. Brown Trafton recently broke the U.S. record in the discus of 222-02 breaking the record held by Suzy Powell Roos. 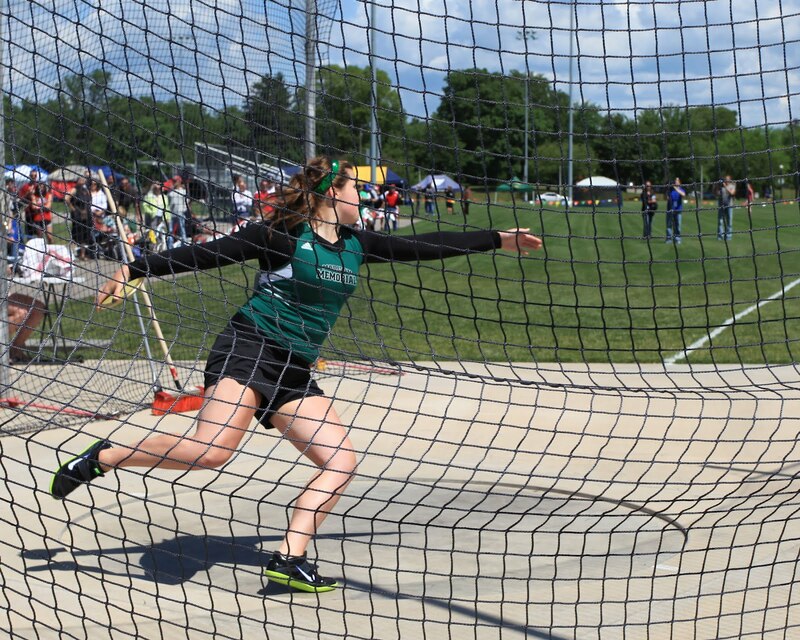 Video I took of Stephanie Brown Trafton's winning throw from last year's U.S. National meet. Reece Hoffa, Ryan Whiting and Christian Cantwell will be representing the U.S. in the 2012 Olympic Games in London this August. Hoffa's throw of 72-2.25 is the best throw in the world this year. The U.S. has dominated the world standings in the Shot Put for several nearly a decade but have no Olympic Gold medals to show for it...will this year be the year the american's can change who stands on top of the podium. This is video I took last year at the Nationals of Reece Hoffa. Congratulations to Madison Throws Club's Kailee Kamps of Belmont High School, for being honored by the Wisconsin State Journal Prep Girls Athlete of the Year. She was also the named the Girls Track and Field Athlete of the year. 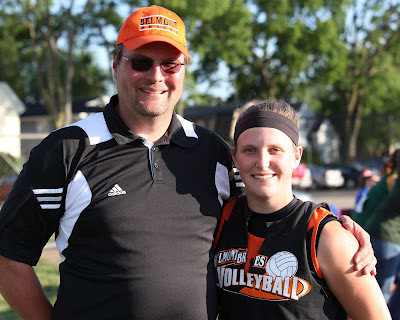 Kailee, your work ethic, integrity, and humbleness are as inspiring as your athletic skills. Good Luck next year at Minnesota! Also, congratulations to Madison Throws Club's Theron Baumann of Monona Grove High School was named the Wisconsin State Journal Prep Boys Track And Field Athlete of the year. Making it a throwing sweep for the Track and Field award. Go Throwers and go MTC! Theron best of luck next year at Marquette - you are ready for the next challenge! The Wisconsin State Journal honors an All-Area 1st and 2nd team in each Track and Field event annually. Congrats to all of the MTC athletes who were honored. The NBC Sports Group presents unprecedented coverage of the 2012 U.S. Olympic Team Trials as American athletes compete for a chance to take part in the London Games. A total of 12 hours of live track and field coverage will be a part of a record 67.5 hours of total Olympic Team Trials coverage by NBC in 2012. Bring Water Bottles this week Monday and Tuesday...its going to be a hot one. Hydration is critical for sports performance. However, hydration is a constant process. You need water through out the day and your work out. Cut down on soda by choosing water more often than not. Gatorade/ Powerade is good as well. Please stay away from ENERGY drinks with lots of Caffiene. Its been a rocky road the past few years for what was once a proud tradition. After being moved from Madison to Oshkosh and then canceled. The Badger State Games will happen this summer! The Youth Track and Field Meet will be held at D.C. Everest High School. on June 23. GO TO: BADGER STATE GAMES REGISTER NOW. Session 1 is Monday, June 11th from 3:30-5pm. Please arrive a few minutes early to check in. Don't let a little rain scare you, unless its raining sideways and lightning we will always try to give it a go. If you have throwing shoes bring them. If you have implements bring them, some will be provided. MTC throwers did a great job as well as the rest of team Wisconsin. 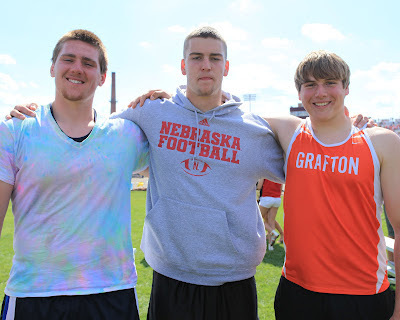 The Spotlight is always the Saturday after the State Track Meet...seniors who are at the top of the Honor Roll list each year should try to make room in their busy end of the year schedules to attend, its a really great tradition. Visit www.wisconsintrackonline.com for Dave Figi's coverage of the Midwest Senior Spotlight Meet. Visit here for GIRLS results and BOYS results. Photo of Jason Zahn ( Discus Champ) by Bob Zahn. Photos of Heather (discus), Kailee (rotational shot put), and Molly (shot put) by Dean Blahnik. Each year the top Senior Athletes in Wisconsin Track and Field are invited to represent Wisconsin at the Midwest Senior Spotlight Meet. The Meet brings the best seniors from Iowa, Illinois and Wisconsin together to battle it out for bragging rights. Good Luck to Jason Zahn, Kailee Kamps, Heather Clankie, and Molly Griep. Go WISCO. Congrats on being invited, your hard-work and dedication over the past 4 years have paid off. Go and enjoy representing the STATE and MTC. More videos from state coming soon. Please check back again soon. Entry deadline into the 2012 USATF Wisconsin Outdoor Championships is approaching. This year's outdoor meet will return to the campus of Carroll University, in Waukesha, June 14-17. Paper entries (USATF-WI Entry Form) must be postmarked by June 8th. Online entries (Junior Olympic Online Entry or Open/Masters Online Entry) close June 9th, at 11:59pm CDT. Also, the Midwest Open Track and Field Championships entry deadline is approaching. The meet is open to individuals in the Midwest Region of USATF. They must be females age 14 and over or male age 16 and over. Throws Club starts in 1 week. Are you registered? Lots of Special Guest Coaches. Jason Zahn 12, Grafton, has had the 12 most consistent discus throws in Division 1 at the State Meet in the past 2 years. But it takes 1 throw to win the State Championship and last year his consistency netting him a silver medal just behind MTC's Drex Jackson. This year, Theron Baumann put Jason to the test as Drex did a year before. After tossing 3 throws in the high 160's to take the lead in trials, Jason watched Theron take his final throw in trials and pass him. What was different this year than last year's second place finish to Jackson? Jason took his throws in finals before Theron and responded with an even bigger throw to win the State Championship. Theron Baumann 12, Monona Grove finished 2nd and A.J. Natter 11, Milton completed the 1-2-3 podium sweep for Madison Throws Club. Great job boys. And Congrats Jason! Kailee Kamps finishes Shot Put career with P.R. I can't think of a better way to finish an illustrious Prep Shot Put career than throwing a P.R. on your final throw at the State Track Meet. That's just what Kailee Kamps did. In what was the toughest competition of the day in the throws, Kailee had to fight through adversity to get her P.R. After watching a fellow competitor get carried out of the circle after slipping, falling and severely cutting her leg - Kailee looked tentative during prelims. However, she would not be denied. Going into finals with a throw of 39-07.50, Kailee decided she didn't want to go down without a fight to the defending champ Kennedy Blahnik. Fight back she did, with great throws in the finals, Kailee finished SILVER with a new P.R. of 45-07.25. Check out the Wisconsin State Journal article here. Molly Griep 12, Whitewater, has qualified for state for 4 years...winning a title has been elusive, until now. I think it was worth the wait. Molly took the lead in trials with consecutive throws of 41-02.5 and 41-08 . She saved the best for last with the win already in hand she threw 42-07.75 on her final throw of the day. Congrats Molly! Check out the Wisconsin State Journal articale here. Theron Baumann 12, Monona Grove took the experiences from his previous State Meet competitions and brought them to another level by winning his first State Title. Theron took the meet by storm by throwing 60-05 on his first throw. For good measure he followed with another throw in finals at 60-09.25. MTC's Jason Zahn 12, Grafton took 2nd with a throw of 56-04.5. Riley Budde 11, Beaver Dam placed 5th with a throw of 54-10.25. 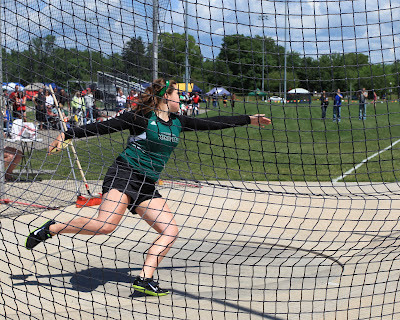 Corinne Franz JR, Madison Memorial started the day off right by winning the D1 Girls Discus. She led the event going into the finals with a mark of 129-11 but wasn't done yet. She threw better on all three of her throws in the finals. Improving to 132-07, 135-04, and finishing at 137-04. MTC throwers Paige Day JR, D.C. Everest finished 3rd, 125-07 and KeKe Burks finished 5th, 123-1.